Earlier in the year, the author wrote an article about Hua Nan Motors, the distributor of DeSoto and Peugeot automobiles in HK from the 1940s to 1960s. Majority of that article focused on King-lai Yee, the chairman of Hua Nan who was a Chinese nightclub owner from Washington DC. It turns out one of Yee’s business partners in Hua Nan was You-Chuck Moy (梅友卓, aka “YC Moy”, 1896-1992, I believe he also went by “James Moy” or “Jim Moy” but this needs to be confirmed), a prominent Chinese American leader from Chicago who was also the head of Yau Kiu Film (友僑影業) and its affiliate Yau Kiu Film Studio (友僑片場), one of the major movie studios in Hong Kong in the late 1940s and early 1950s. 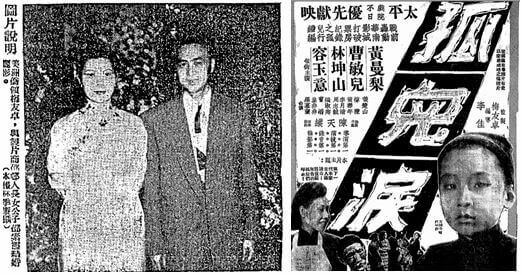 Chinese Americans played an important role in the early years of the movie industry in Hong Kong with pioneers such as Joseph Sunn Jue (趙樹燊 ,1904-1990) and Moon Kwan (關文清,1894-1995) from San Francisco and their Grandview Film contributing talent and technical expertise while merchants like Moy contributed financial capital. Moy co-founded Yau Kiu (which was named after him as it means “friendly compatriot” and the first character “友” is the same as the first character of his own name) with his wife Tso Yee Man (曹綺文, 1918-1948) and his brother in law, the famous actor Walter Tso Tat-wah (曹達華,1915-2007) who were also stars of the studio. A native of Toishan (the hometown of many of the early Chinese immigrants in America) in Guangdong province, Moy (which is based on the Toisanese pronunciation of the last name; in Cantonese it is typically Mui) lost his father at a young age and was sponsored by an uncle from Cuba. After finishing primary school, working in a shop and getting married in Toishan, Moy migrated to Cuba and then went to Chicago with the help of a cousin Moy You-yung (梅友容). Moy Dong-chow (梅宗周, aka Hip Lung which was the name of his business), who was one generation above YC and built Chicago’s Chinatown, helped to bring many of his clansmen over to Chicago and by 1920 around the time when YC arrived, the Moys from Toishan was a major force in the Windy City numbering over 800. It was in this environment that YC made a fortune and became a successful merchant. During the Sino-Japanese War, YC Moy established the Chinese Emergency Relief which raised over US$3 million for the war relief effort with Moy himself contributing over US$100,000. After the War, Moy returned to China to participate in the reconstruction and thanks to his involvement in overseas Chinese affairs, he was appointed delegate to the National Congress and central committee member of the Kuomintang. He moved to HK where he invested in a number of businesses including Hua Nan Motors, a life insurance company and two trading companies but the most prominent of all was Yau Kiu. The driving force behind Yau Kiu was his new wife Tso Yee-man, whom he first met when she visited Chicago in 1939 to perform for a war relief benefit. Like Moy, Tso was a Toisanese and worked as a teacher before joining the Grandview Film Co in 1935 as an actress. In 1940 when she was interviewed by the New York Times (which called her the “Mary Pickford of China”), she was married to Moon Kwan (who directed many of her movies) and had already made 21 movies by that point. In 1941, she starred in Golden Gate Girl (金門女), a movie directed by the Chinese American director Esther Eng and the cast include the infant Bruce Lee in his film debut. Moy and Tso were married in HK in 1946 and established their residence at 362 Prince Edward Road. Soon they established Yau Kiu and set about building their movie empire in Kowloon City near the Hau Wong Temple. Yau Kiu’s 48000 square feet site in Kowloon City was right next to two other movie studios – Sai Kwong (世光片場) and National (國家片場), making the area a mini-Hollywood in HK in the late 1940s and early 1950s. The Yau Kiu Studio consisted of two studios – one for Cantonese films that was primarily used by Yau Kiu Film and another for Mandarin films which was rented out to other film companies. The studio was equipped with the latest movie production equipment including Mitchell camera from the US, making it one of the most advanced movie studios in HK at the time. The first movie Yau Kiu produced was Woman’s Heart (天下婦人心) in 1948, starring Tso Yee-man herself and Cheung Wood-yau. On November 20, 1948, Tso Yee-man suddenly passed away at the age of 30 due to pneumonia. The devastated Moy completed her last picture Romance Forever (生死纏綿,which was released in 1949) and continued to make pictures at Yau Kiu with his brother in law Walter Tso. According to the HK Movie Database, Yau Kiu produced a total of 16 films and filmed another 13 during its existence. Many of these featured Walter Tso who was a top movie star at the time (he kept a horse stable in the studio) and were directed by Wu Pang, who was later known for the Wong Fei Hung series of action movies. The most successful series produced by Yau Kiu was Thirteen Heroes and Seven Swords (七劍十三俠), which included 4 films written by production assistant Chang Ming-chuen, under the pen name of Chang Kam-ming (蔣金名) and starring Walter Tso and the actress Law Yim-hing. 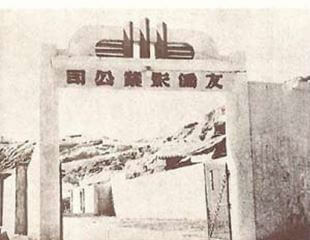 In 1952, the Mandarin movie studio of Yau Kiu was burnt down when a short circuit took place in one of the movie sets. From then on Yau Kiu stopped producing pictures but the studio was still used by other production companies such the big ensemble charity film Feast of a Rich Family (豪門夜宴) in 1959. In 1960, a fire broke out in the studio and some of its films were destroyed. The studio was eventually absorbed by Great Wall Movie Enterprise (now part of Sil-Metropole Organization), a leading maker of Mandarin films in the 1950s and 1960s and the area was later taken over by various small factories. In 2001, the government took over the area for re-development and the area has since become the home to HKICC Lee Shau Kee School of Creativity and Stone House Family Gardens. Left: Actor Cheung Wood-yau and Tso Yee-man in her last movie – Romance Forever. Right: poster of Peach Blossom Hero, produced by Yau Kiu in 1949 with Walter Tso (on the right) as the lead character. In an interesting move, YC Moy married Susan Shaw (邵素霞), the only daughter of Runde Shaw (邵邨人,1898-1973), the head of the Shaw & Sons Studios (and older brother of Sir Run Run Shaw of Shaw Bros and TVB) in March 1949, only months after the death of his wife Tso Yee-man. Later that year in August, his name was all over the headlines as four armed burglars broke into his residence in Observatory Road and took HK$10000. 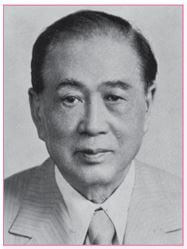 Moy returned to the US in the 1950s although he returned regularly to HK and Taiwan for business and political engagements in the next decades. His marriage with Susan Shaw did not last and both re-married. (In 1966, Susan took over the café inside Gala Theatre in Mongkok which was owned by Shaw & Sons) In his later years, Moy remained active with overseas Chinese affairs well into his 90s and served as chairman of the World Moy’s Clan Association for multiple terms. Walter Tso remained active in show business until the 2000s, having starred in over 700 movies and TV shows in his career which spanned seven decades. There is a false rumor that Tso was the owner of the Wader Film studio which he lost at the gambling table – the truth is he had nothing to do with Wader (whose Chinese name is the reverse of his name which might have been the cause of the confusion) but was a shareholder of the Yau Kiu studio which was not closed due to his gambling problems. Tso did own the Palace Theatre (皇宮戲院) in Pak Ho Street in Sham Shui Po which opened in 1953 and had to sell it together with other properties to pay off his gambling debts in the 1960s. This article was first posted on 25th September 2017.